Is the Tonkinese the Right Cat Breed for You? Is the Tonkinese right for you? Merging the best in personality and coat color from the Siamese and the Burmese, the extroverted and affectionate Tonkinese is a "new" breed with much older roots. With soft hues of sepia and mink, this elegant cat is a picturesque addition to any home, but their playful and loving attitude, and their natural affinity for curling up in laps, is really what has made them such a popular pedigreed breed. It is believed the first Tonkinese, Wong Mau, arrived in the United States in the 19th century, mistakenly identified as a Burmese. Wong Mau was a naturally occurring example of her breed, though the breed hadn't yet been named. The modern Tonk is the result of cross breeding the Siamese and the Burmese in an attempt to replicate the Tonkinese of an early period. The Tonkinese is a medium sized cat with a muscular, rectangular build. While not delicately boned, the Tonkinese isn't stocky either. Their legs and tail are slim but proportionate, and they have medium-sized oval feet. The head is described as a short, modified wedge, slightly longer than wide and with gentle contours. The muzzle is medium in length, with a slight taper to a blunt finish. The nose has a slightly convex curvature. The ears are longer than they are wide with oval tips. The eyes have an almond-shaped curve on top with a rounder bottom lid. They are medium-sized and proportionate with the face. Eye color corresponds with coat, featuring greens, golds, and blues. The coat is medium-short in length, silky and fine, close-lying to the body. The Tonkinese comes 3 patterns (solid, mink, and pointed) and 8 colors: seal, chocolate, cinnamon, red, blue, lilac, fawn, cream, and tortoiseshell. The pointed Tonkinese has a very distinct difference between body and point colors, while mink is somewhat less contrasted, and the solid Tonkinese is barely contrasted at all. Tonkinese kittens may be born a lighter shade, and developer darker coloration as they age. It can take up to two years for a Tonkinese coat to fully develop. The Tonkinese is a people-loving breed, affectionate and out-going. 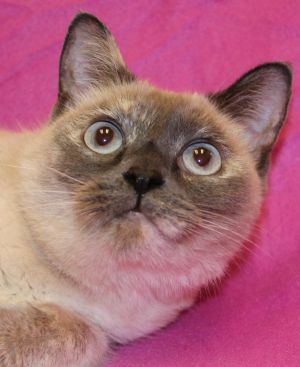 The Tonkinese will greet your guests as if they were its own and quickly try to make friends. This is a cat who will take every opportunity to crawl into a lap. They can be demanding in their need for attention, but they never fail to reciprocate the love they receive. The Tonk will be most appreciated by those looking for a close companion. Intelligent and inquisitive, the Tonkinese will watch over everything you do. When you're not home, the Tonk may get bored easily and find ways you may or may not approve of to entertain themselves. They do well with having a feline companion to keep them company, and they also enjoy puzzle toys. Make sure the treats are well secured: the Tonkinese will make quick work of easily opened doors and cupboards. They're also active and athletic, and no shelf is too high to reach - or at least, they won't know until they try. The Tonkinese is a family-friendly breed who enjoys the extra attention and energy of polite children. They do well with other cats and may be particularly grateful for the extra company if you're away for much of the day. And be warned – the Tonkinese has inherited some of the Siamese chattiness, though with a somewhat softer voice.